Latitude & Longitude: 31°55'59.99286", -95°20'32.54403"
Elijah Earle (1804-1880) and his second wife, Mary Elizabeth Jarratt Tatum (1824-1904), set aside land for this graveyard in 1858. Elijah selected his own burial site at the time, marking it by carving his initials on a tree trunk. He was buried here on New Year's Day 1881. His is the earliest documented grave in the cemetery. W. J. Ragsdale (1811-1884), a veteran of the Texas War for Independence, is buried here, as are veterans of the Civil War, World War I and World War II. Other graves include those of area pioneers and several generations of their descendants; T. J. Skelton and Robert Tatum, who built the Earle's Chapel Methodist Church building in 1889; and a number of victims of the 1918 influenza epidemic. The original four-acre plot was enlarged in 1889 when Elijah's son, Lon Earle, donated an additional two acres of land. Three more acres were added in 1972. The Earle's Chapel Cemetery Association, founded in 1966, maintains, beautifies and promotes the cemetery in honor of past, present and future citizens of the community. 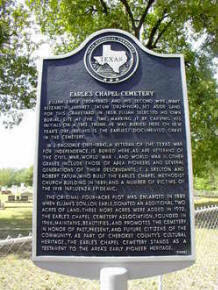 As part of Cherokee County's cultural heritage, the Earle's Chapel Cemetery stands as a testament to the area's early pioneer heritage.